Among the variables that seem to determine social progress, two stand out as particularly special. The more our intelligence gains access to what we may call “Inner Space,” both to the domain of very small size scales, what we will call “Physical Inner Space”, and to the domain of very powerful brain-based and computer-based simulations, or “Virtual Inner Space”, the faster we learn to generate major new economic, social, and adaptation benefits for civilization. What I suggest we call a Great Race to Inner Space appears to be the dominant developmental trend for our species. This is a surprising future, not something most of us expected. We’re just now waking up to understand this race, and its many implications for our future. 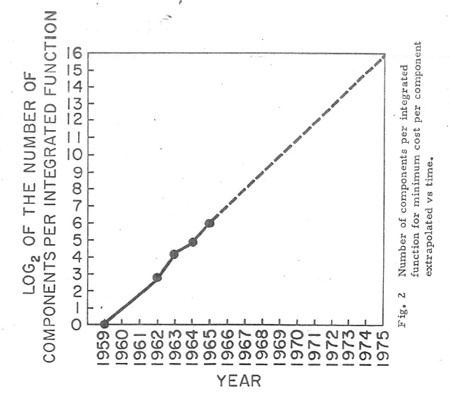 Most of us have heard of Moore’s law, the industry observation, first made by Gordon Moore in 1965, that computers double their transistor density on integrated circuits (and double their performance and efficiency as well), roughly every two years. In an excellent essay, Was Moore’s Law Inevitable? The Technium, 17 Jul 2009, the great futurist and technology scholar Kevin Kelly asked whether technological acceleration is baked into the way our universe works, and must happen whether we want it to or not. Kelly considered the evidence and argument for this question, and concluded that this may be the case. We will reach the same conclusion, and explore a few of its many exponential implications for our future. The more we pay attention to this question, at the center of a still-emerging academic field we can call acceleration studies, the better our answers will become, and the more wisdom and foresight we may gain about the accelerating aspects of our past, present, and future. Physical densification (miniaturization and/or density increase) measurable in spatial, temporal, energetic, or material/mass (STEM) terms. Informational dematerialization (growth and substitution of informational for physical processes), measurable in information, intelligence, computation, or complexity (I2C2) terms. Replicating systems that can continually engage in densification and dematerialization are very different from replicating systems with fixed complexity, such as replicating biological organisms with a relatively stable genotype, as they expand into an ecological niche. As we’ve said, the growth of such typical replicators is on an S-curve of acceleration followed by deceleration, or — if it is in competition with other replicators — perhaps on a C-curve, in which the saturating population periodically suffers sudden small or large catastrophic collapses. But at the same time, replicators at the leading edge of local complexity are continually able to use advances in D&D to escape the STEM (space, time, energy, and matter) resource limits that would otherwise halt their local acceleration. They move into increasingly resource dense, efficient and intelligent domains. As we discuss, evolutionary development and the I4S processes are our best current model for understanding these dynamics, and the sociotechnical acceleration that is increasingly transforming our world. The late physicist Abraham Pais wrote an award-winning biography of Albert Einstein, one of the 20th centuries most unique minds, ‘Subtle is the Lord…’ (1982/2005). Subtle is often cited as the best work on Einstein’s mental journeys in physical theory, and a great summary of the conceptual revolutions they created. 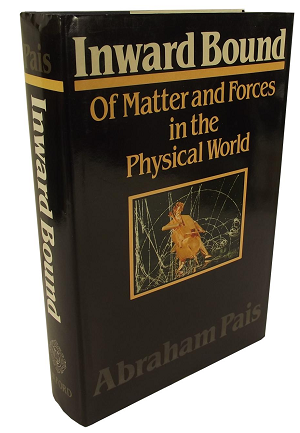 Pais wrote another equally majestic but far less known book, Inward Bound: Of Matter and Forces in the Physical World (1988), which is particularly relevant to this chapter. Inward Bound is a history of the late 19th and 20th centuries race into physical inner space, to ever smaller scales of physical theory and experiment, and of the scientists and technologists who made those contributions. Inward Bound tells us that between 1895 and 1983, in just under 90 years, the smallest distances accessible to scientific minds shrunk a hundred million fold. Please stop reading for a moment, and let that observation sink in. In the length of one person’s lifetime, our still-primitive science managed to leap eight orders of magnitude deeper into physical inner space than human physical and informational experimentation had ever ventured before. As we’ll see in this chapter, all of humanity’s greatest advances to date have been accompanied by dramatic leaps forward in the intelligence, diversity, and virtuality of our societies, and in the density, miniaturization and efficiency of our information technologies. Human minds and bodies are Inward Bound at ever-accelerating rates, though we don’t yet realize it broadly in science today. When we think about things from a particular set of perspectives, we see that not only human history, but universal complexification to date has been primarily a journey inward, into physical and virtual “inner space.” Every substantially more complex adaptive system, every significantly more advanced information-processing “substrate”, has occupied dramatically more local domains of space and time as it builds the next layer in an universal hierarchy of accelerating complexity and intelligence. I first saw this trend toward “locality” of universal intelligence as a middle school student, contemplating black holes and thinking about the universe in 1972, and have been exploring it ever since. A familiar history of [accelerating] physical complexity begins with universally distributed early matter, leading next to large scale structure and superclusters, then to the first galaxies, then to metal-rich replicating stars within special galaxies, then to stellar habitable zones, then to prokaryotic life existing on and around single planets in those zones (miles deep in our crust, miles in the air, and evolved in situ or as planetary ejecta on meteorites in near space), then to eukaryotic life inhabiting a far more restricted domain of the special planet’s surface, then to human civilizations living in yet more localized domains, then to humans (each with 100 trillion unique synaptic connections) in industrial cities emerging as the leading edge in those civilizations, and perhaps soon, to intelligent, self-aware technology, which will have even more unique connectivity, and inhabit, at least initially, a vastly more local subset of Earth’s city space. Self-aware computers may themselves be able to enter far more miniaturized and local nanocomputational domains. Thus, to a first approximation, the increasing spatiotemporal locality of leading edge substrate emergence looks like universal complexity heading toward transcension [reaching black-hole-like densities, and increasingly, leaving our universe behind] as it develops (Smart 2008). Perhaps the simplest way to understand the Great Race is to see this increasing space-time locality of our leading complex systems as some kind of physical and informational law, like gravity, that is yet to be discovered. That’s the way I first thought of it as a high school student, and I haven’t come up with a simpler way of thinking of it since. That perspective argues that technology is just the next natural universal intelligence substrate, presently learning how to take over the role of being the fastest-improving local complex adaptive system, at the leading edge of all this accelerating change. It’s important to have the right physical and informational perspectives when we think about rates of change. For example, all living systems have molecular processes that occur extremely quickly, when we observe them at quantum scales. But biological systems don’t appear to store much meaningful information (information we can tentatively define as both unique and persistent, in both space and time) at quantum scales. Biological systems must function in a way that is robust to quantum processes, and occasionally even exploit them, as in the way photosystems work in bacteria, or the way birds may sense magnetic fields. But almost all of biology’s higher complexity, including our brains, uses far more conventional physics, and it appears to function in spite of often-chaotic quantum processes, not because of them. We must state that the future of human information processing does seem to be in the quantum domain. We are furiously miniaturizing and virtualizing our electronic systems today, pushing them increasingly down to the quantum scale. But when quantum computation comes into its own, it won’t be blind evolution that harnesses that computation, but intelligent beings. As the I4S processes tell us, as intelligence emerges it not only gets better at using random and evolutionary processes, it also makes some of those processes more predictable (developmental) over time. This Great Race to Inner Space is perhaps the easiest way of understanding that technology is the next local hierarchical system of intelligence, being built by our universe, through us. The reason technological minds will outcompete human biological minds, which are currently the leading edge of living intelligence on Earth, is because they are on track to being far smaller, faster, more efficient, and more resilient. These new postbiological systems are capable of encoding, remembering, and simulating more of reality, and thus eventually being more adaptive, than anything biology could ever produce. Many of us assume, quite naturally, that human destiny lies in the stars, in Outer Space. We’re going to eventually go out and colonize the universe, aren’t we? Most definitely not, in my view of things. With the exception of brief and very limited reversals, humanity has long been heading 180 degrees in the opposite direction, to Inner Space instead. 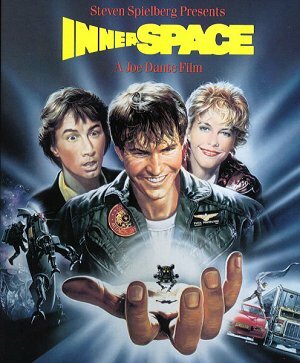 Innerspace is a fun and lesser known Steven Spielberg film, if you like light comedy sci-fi entertainment. But it is also a key word helping us understand our future. In other words, when we review the accelerating growth of both physical and virtual inner space, we realize that our civilization hasn’t been growing into the universe as it develops but rather growing out of it, in an accelerating manner, very much like how an awakening baby grows a mind, a mind that lets it spend more time thinking, and less time acting, and doing much more experience-directed acting, the more developed it gets. Helping others to understand these natural processes of D&D, and their many implications for foresight, is one of my motivations for writing this Guide. Consider that in terms of physics, we’ve seen accelerating spatial, temporal, energetic, and material (STEM) efficiency and density — taken together, STEM compression — of our universe’s most complex, adaptive, and rapidly-improving systems. This accelerating complexification has been driven by a relentless migration inward, into physical inner space, at either an exponential or superexponential pace, depending on the system or time period in question. Physically speaking, human beings live in a vastly smaller and briefer spatial and temporal domain than the prokaryotic life that preceded us. We are also busily engaged in creating intelligent technology that must, at the leading, most productive and competitive edge, migrate into even more STEM-efficient and dense nanotechnological and quantum realms. Leading complex systems, those that generate the greatest intelligence, productivity, and wealth are continually using less STEM resources to do more per any standard of action, thought, or transformation. In terms of information, our leading systems enter increasingly complex and adaptive virtual inner space, simulations and models, the more advanced they get. They get exponentially better at virtualization, simulation, representation, and the creation of representative (modeling) intelligence, or “mind”. As we’ll see, adaptive systems must also create more useful forms of innovation, interdependence (empathy and ethics), immunity and sustainability to stabilize their growing intelligence, and to survive in an increasingly complex world. Leading virtual systems on our planet increasingly substitute thinking over acting, one measure of dematerialization, because their the better their simulations get, the faster and more efficiently they can explore, discover, create, and compete in mental realms than they can in slow, simple, boring, expensive, and dangerous physical realms. With the growing power of our digital world to sense, simulate, and optimize myriad processes in the world, and the advent of virtual and augmented reality, and biologically-inspired forms of computing like deep learning, we can see that our computers, for their part, are learning how to enter virtual inner space as well. As we’ll see, we can expect them to do this far faster and with far greater complexity and autonomy than the biological humanity that is presently building them. Inner space isn’t an easy concept to entertain. It doesn’t fit our primate intuition, which is well-geared for modeling and journeying into the next-adjacent Outer Space environments around us. Exploring our “next adjacent” domains of physical and mental space is how we’ve mastered our surroundings up until now. First we came down from the trees, then we journeyed out of Africa, and now we’re exploring our neighboring planets, though is being mostly done via our primitive robots, rather than in person, an important distinction that we will revisit later. On first glance, it looks like humanity is still journeying outward, at least in physical space. But look closer, and you will see a very different story. Humanity’s advances to date have all been directly driven by great leaps in the miniaturization, densification (close-togetherness) and efficiency of our technologies, and in the dematerialization, diversity, virtuality, and intelligence of our societies. The more our civilization gains access to “Inner Space,” both to the domain of very small size scales (physical inner space), and to the domain of very powerful brain-based and computer-based simulations (virtual inner space), the faster we learn to generate major new STEEPS (scientific, technological, economic, environmental, political, and social) benefits. Bucky Fuller, discussing his Geoscope proposal (Earth sensing and simulation platform) between 1962 and 1975, according to Joshua Arnow of the Buckminster Fuller Institute. Regarding physical inner space, the 20th century futurist R. Buckminster (“Bucky”) Fuller called growing physical resource (STEM) efficiency “ephemeralization.” He noted that leading systems are always figuring out how to do more and more physical transformation or production of any standard output (product, service, information, etc.) with less and less energetic and material resources over time. 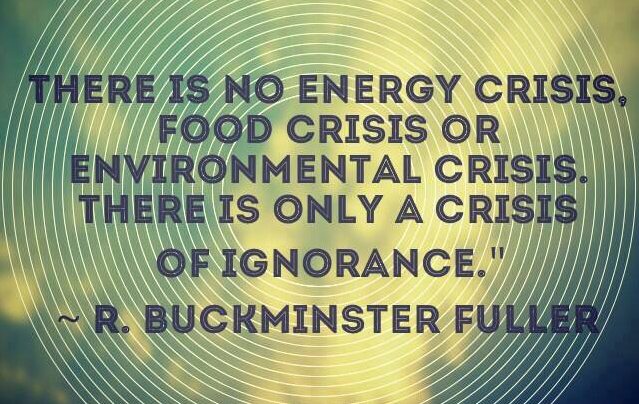 This and other insights led him to one of my favorite 20th century quotes with respect to the energy, food, and environmental “crises” that were first being carefully contemplated by environmental foresight leaders in the 1970s: “There is no energy crisis, food crisis, or environmental crisis. There is only a crisis of ignorance.” The real challenge, as he saw it, was seeing and funding research and development of all the ephemeralizing strategies and paths that would continue to lead us to a coming, inevitable world of intelligence and abundance. Another great quote of his, relevant for all democracies under threat of growing plutocracy, is that: “The end move in politics is always to pick up a gun.” Though he was a bit too utopian at times, Bucky was a cosmic thinker and truth teller who saw some things far deeper and better than others. See Steven Sieden’s Buckminster Fuller’s Universe: His Life and Work (2000) for a good bio of this leading 20th century thinker. Ephemeralization was a key insight into the nature of change in increasingly information-rich and intelligent environments, but it was also incomplete. To get from ephemeralization to STEM compression, we have to add at least two more insights about accelerating change. First, we need the recognition that not only is ephemeralization (efficiency growth) occurring in energy and matter inputs to complexity growth, it’s occurring in spatial and temporal dimensions efficiency dimensions well. Not only are our leading systems doing “more with less”, they are doing it ever more time and space efficient ways as well. This growing STEM efficiency in our most adaptive complex systems tells us quite a lot about who and what “wins” the future, and the kind of competition and cooperation that best creates social value. Second, we need to to recognize that not only do our leading systems get more STEM efficient (ephemeralize) they also engage in STEM densification. The most successful systems are always finding new ways to increase the process density of their critical adaptive systems (brains, metabolisms, muscles, productive abilities) by moving them closer together in physical (spatial, temporal, energetic, and material) measures. “compression”, by making significant advances in either the efficiency or density of their critical processes, and ideally, in both at the same time. Their growing efficiency lets them do more with less, as Bucky said, and their growing density allows them to arrive at smarter and more powerful processes faster than their competitors. Both goals are critical to adaptation. Again, we can call STEM efficiency and density together by the phrase STEM compression. We will also call them by a single word in this Guide, “densification”. As we’ll see, when we miniaturize critical adaptive processes, moving them to ever smaller physical scales, we gain powerful new ways to increase their resource efficiency and performance. Simultaneously, whenever we can increase density (close-togetherness) of our critical adaptive systems, we also improve their efficiency and performance. Thus we will use the word densification to refer to both of these key things, the miniaturization and the density-increase of adaptive processes, when we measure them in either spatial, temporal, energetic, or material (STEM) terms. STEM compression was first described as a potentially universal process, to the best of my knowledge, on my website Acceleration Watch in 1999. Note the black hole on the right side of the banner, black holes are special environments where accelerating STEM compression must always stop, in our universe. We’ll say more about them later. In my view, densification gives us a good basic picture of how complex systems produce an accelerating emergence of new forms and functions in physical inner space. Consider how Earth’s leading innovations today increasingly happen either at very small scales or in increasingly dense configurations in physical, chemical, biological, social, or technological processes, or inside computers, their networks, and software. But the physical story isn’t the whole of acceleration. Something is happening informationally as well. The most adaptive complex systems are continually achieving exponential growth in their informational resources and their mental abilities. Today, our leading digital nanotechnological processes are using less and less physical resources to produce more and more information, intelligence, and social value. Like the growth of nervous systems in higher organisms, these special technological systems are continually become “less matter and more mind.” That phrase, as sloppy as it sounds to scientists, remains a great shorthand for the nature and dynamics of Virtual Inner Space. In Chapter 11, in the Five Goals of Complex Systems, we’ll propose there are at least five ways that virtual inner space evolves and develops in our most adaptive systems, in biology, society, and technology. I’d like you just to consider just three for now. The most successful complex systems grow their intelligence, interdependence, and immunity over time. They see the world with greater and more accurate simulation capacity, they find more ways to protect their group complexity, and they find more ways to interact to produce win-win solutions for the group. The reason mental or virtual abilities of leading systems accelerate over time will be referred to by another single word in this Guide, “dematerialization“. Dematerialization refers to the substitution of either information or computation for physical processes and systems. Dematerialization happens when we use our thinking minds, to replace doing an experiment in slow and expensive physical space. Instead, we imagine the outcome, in a much faster and less resource-intensive virtual space. Again, dematerialization happens when we use either information, or some form of intelligence, such as the software in a computer to replace a physical activity, like engaging in videoconferencing rather than traveling to meet in person, or when we use information technology to replace a physical device, like the way a clock, a map, a radio, a music player, a video recorder, and many other physical devices are replaced by a smartphone. Like the term densification, the term dematerialization includes the concept of STEM efficiency, but it goes beyond it, describing a world where thinking and simulation not only make physical processes more efficient, but thinking increasingly outcompetes physical actions, both to produce economic value, and to grow adaptive complexity. We can think of densification as the “engine” of accelerating change, driving Earth’s leading systems ever further into physical inner space, and dematerialization as the “steerer” of accelerating change, driving us ever further into virtual inner space. Both of these are oversimplifications, but they are close enough for the “engine” and “steerer” analogy to be worth remembering and using, whenever we can. So those of us who want a simple, Big Picture understanding of accelerating change can use these two words densification and dematerialization, or “D&D”, to both quickly and surprisingly deeply understand where the world is going. D&D is an acronym that refers to a popular game Dungeons & Dragons, that some of us played as kids, and a few of us (myself excluded) still play as adults. D&D is also my favorite acronym for understanding the Great Race to Inner Space. It is an acronym that concisely describes the dual physical and virtual nature of accelerating change. I hope you’ll remember and use it, to improve the foresight you produce. To move our key adaptive processes into ever smaller domains (miniaturization) and ever closer together in space, time, energy, and material terms (densification). To create ever more information-rich environments, and ever more intelligent simulations of our surroundings, which allow us to substitute information and computation for physical processes (dematerialization). As a consequence of D&D, I believe we can say the following. of all increasingly complex systems in the universe. Clearly there is a lot of science, economics and sociology waiting to be described here. That work will have to be done by others. I am a futurist and a systems philosopher, not a scientist. My job in this Guide is to offer the most helpful way I know to see the two apparently universal megatrends that drive accelerating change, megatrends that guide our collective futures. Others will surely build on and critique this perspective in coming years. In 1909, at the start of the amazing 20th century, the technology scholar Henry Adams was apparently the first to write publicly about acceleration as a universal process, in the English language at least. Today we’d call him our first formal singularity theorist. We’ll revisit Adams and others later, in A Brief History of Acceleration Awareness: 1600-1965. But it wasn’t until the advent of the microprocessor and the postulation of Moore’s law in 1965, that the general public started to become broadly aware of accelerating change. No single book did more toward this end than Future Shock (1970), by the futurists Alvin and Heidi Toffler. The Toffler’s informally introduced the Three Ps Foresight Model, near the end of this classic work, as we said in Chapter 1. But main theme of Future Shock, and perhaps its greatest contribution, was making accelerating change comprehensible to so many people, and describing the sometimes disorienting and disruptive psychological and organizational effects of the social acceleration of change. The first two chapters of Future Shock, The 800th Lifetime and The Accelerative Thrust, did an excellent job describing the acceleration of communication, information production, and innovation throughout human history. This work, and its successors, which are largely direct extensions of it, propelled the Tofflers to the well-deserved status, in my view, as the most important futurist couple of the 20th century, though Heidi, as his constant collaborator, never took the public credit she deserved. Piel (1972). A courageous early book on the phenomenon of accelerating change. 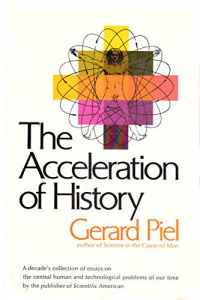 In 1972, another important book The Acceleration of History (1972) made the case for the a general process of societal acceleration. It was written by Gerard Piel, distinguished editor-in-chief of Scientific American (1948-1984). Piel considered this one of his greatest works, and he hoped it might advance the science of accelerating change. But unfortunately, for reasons we’ll consider later in IDABDAK: Our Social Responses to Acceleration and Development, most of the scientific community continued to ignore the phenomenon of accelerating change. Then in 1977, scientist Carl Sagan, first in his Pulitzer Prize-winning book, The Dragons of Eden, and next in his award-winning television series Cosmos (1980) introduced the metaphor of the Cosmic Calendar, a way of portraying “significant universal events” in the history of universal complexity emergence onto a 12-month calendar year. The cosmic calendar makes it evident that the universe itself has been accelerating in its production of local complexity, at least since the emergence of the first galaxies, perhaps 8-10 billion years ago. The picture at right is a modern version of the Cosmic Calendar. It shows an incredible speedup in the number of significant emergence events, the closer we get to the present time. Carl Sagan’s Cosmic Calendar: 13.7 Billion Years of Universal History, Projected as “One Cosmic Year”. Beautiful creative commons image by Wikipedia author Eric Fisk. When we see depictions like this, curious people are compelled to ask: Is this apparent acceleration due to an arbitrary selection of “significant” events? Is it due to some hidden bias in human cognition, or the nature of memory? Though we don’t know for sure, as few scientists currently study this issue, this acceleration looks to be quite real. As we’ll see later, various definitions of morphological and functional complexity, of information and computation production, of energy flow density, and of a handful of other complexity and STEM-related variables have shown this breathtaking speedup, in a range of studies done by scholars. The closer we get to the present time, the more “meaningful stuff” we always see happening in the universe, stuff that seems directly related to further structural and functional complexity increase. Understanding the reasons for this acceleration is clearly one of the most important things we can do as a species, to improve our collective foresight. 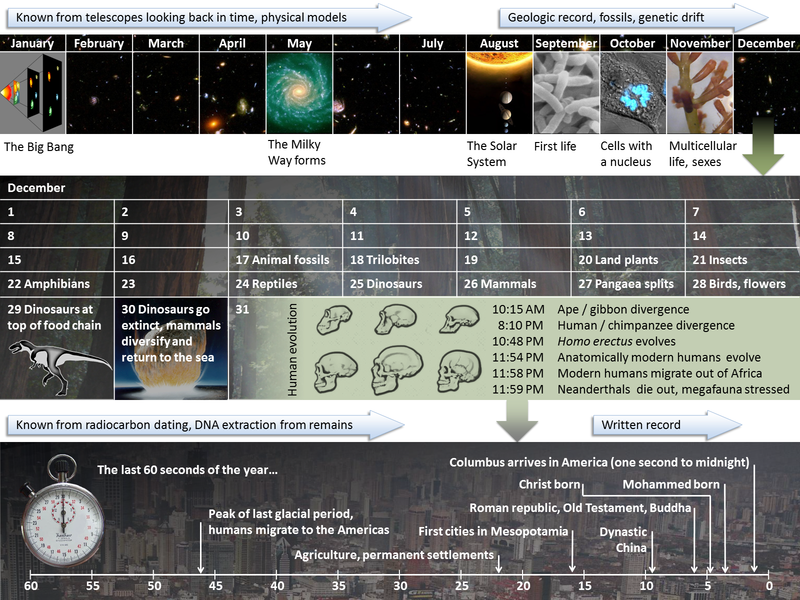 Curiously, the calendar also shows, in a pattern obvious to any high school student, that complexity emergence actually decelerated in the early expanding universe, for at least the first billion years of our universe’s early history, before gravitational effects, and galactic evolutionary development, became the leading drivers of universal complexity. That means there is actually a U-shaped curve to complexity emergence in our universe. Our history begins with kinetic deceleration, followed only later by acceleration, once the universe was largely unfolded. We’ll consider why this U-shaped curve might exist in Chapter 11, when we see the similarities between the universe and a growing embryo, which has the same deceleration-acceleration curve at the beginning and end stages of its own replicative life cycle. Notice also that each newly emergent complex system, from stars to cities, from prokaryotes to computers, appears to use vastly smaller quantities of space, time, energy, and matter or STEM, to do information production, computation, or physical transformation, than the system that came before it. Contemplating this pattern as a middle school student in the 1970s, I came to call this phenomenon STEM efficiency and density increase, or STEM compression when considering both efficiency and density together, a term I still find useful today. Due to the particular physical and informational laws and initial conditions of our universe, leading systems continually discover new ways to use less of the physical (STEM) resources of “outer space” to create more novelty, intelligence, morality, immunity, and capability in “inner space”. The longer we ignore accelerating planetary processes of densification and dematerialization (D&D), and with regard to dematerialization, the accelerating innovation, intelligence, interdependence, immunity, and sustainability (I4S processes) in our most adaptive systems, the longer our STEEPS strategies and actions will remain unenlightened, stuck in the past, ineffective, and focused on the wrong goals. The longer we wait to study these universal processes with the rigor they deserve, the longer we remain burdened with preventable suffering, living in the flatlands below the knee of the next big advance in capacity building, intelligence advancement, wealth creation, and progress. Even the academic field of Big History, which tells the Big Picture story of complexity emergence, has remained silent, so far, on this Great Race to Inner Space. I’ve had personal conversations with the field’s leaders, and they don’t yet even discuss it as a possible scenario for the future in their introductory texts. That is unacceptable, and failure of nerve on their part. Ultimately, they are going to have to recognize accelerating change, as the Great Race is going to continue, and it will get ever more stunningly obvious as the 21st century unfolds. Later in this chapter we’ll talk about being an evo devo and exponential activist. We’ll see that just advocating for accelerating change, what we can call exponential foresight and activism, isn’t enough. We need to think like leaders, and have a vision of progress, of where the world is going and why. 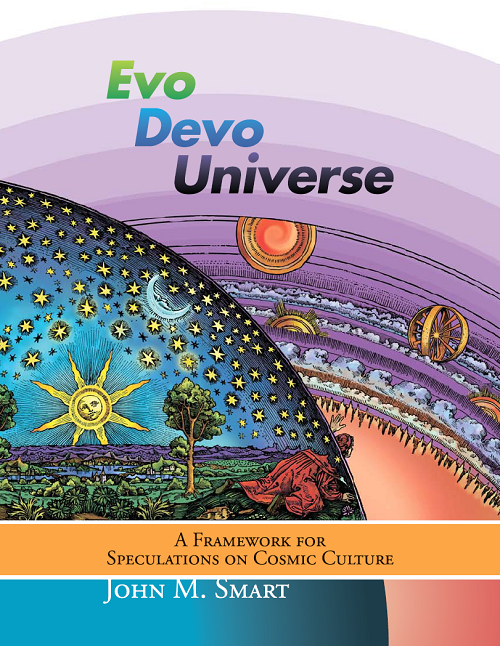 For us, that vision, our working theory of progress, is the Five Goals, in a framework we call evo devo foresight. Meanwhile, let’s look closer at these two universal megatrends, densification and dematerialization, and their implications for biological humanity, a topic I like to call substrate shift, and see what we can see.